Deliverance Escape Rooms currently have two rooms running: The Cabin In The Woods and The Bank Job: The Ultimate Gamble. This will shortly be followed by our third room, Besieged – Our War, with a fourth room also following within the near future. How long does the whole experience last? Each room lasts for around 80 minutes in total – being approximately 60 minutes in the game plus a briefing beforehand and photo and debriefing opportunity at the end of your game. Please arrive 10 minutes before your scheduled game time so that the briefing can be conducted without running into your room time. Yes, all bookings are private and so it will just be your team in the game during the entire experience. Ou rooms are suitable for 2-6 people. Although none of our rooms are strictly ‘horror’ themed, there may be moments which may not be suitable for younger individuals, and therefore we recommend a minimum age of 16. Can I book for larger groups? Our rooms are suitable for up to 6 players, so larger groups will need to split into teams and play different rooms – when all 4 rooms are open we will be able to cater for 24 people playing at any one time. For team building events please contact us for pricing and availability, as well as other options we could cater for. Can I organise a birthday party, stag/hen do or other celebration? Deliverance Escape Rooms is a great experience for all occasions. Please contact us with your requirements and we will endeavour to provide you with a fantastic experience. Please note due to the theme of out rooms Children’s parties are not catered for. Please visit our Booking Page for prices. Please note our prices are per player, with off-peak (Monday-Wednesday) and peak (Thursday-Sunday) rates. For special events or corporate bookings please contact us for pricing details. Can we purchase gift vouchers to give as presents? Yes, we have a range of different gift vouchers available at Deliverance Escape Rooms which will make amazing presents for your friends and family. Please visit our booking page for further details. Gift Voucher tickets can be redeemed as full or part payment via the usual online booking system. Please note that gift vouchers are valid for 12 months from the date of purchase. What if I turn up late? You must arrive 10 minutes prior to your allotted game time in order to ensure that the briefing can be completed and the game started on time, therefore please be sure to leave time for travel and parking. If you are more than 5 minutes late your game will be started as a no show and is non refundable, you will be allowed to take part if late however you will only be provided with the remaining time on the clock at that moment in time, as any over running games will then have a knock on effect for customers attending later in the day and therefore this will need to be avoided. Deliverance Escape Rooms is a ticketed, live event. Once a booking is confirmed refunds are not possible. If you become aware of any issues for an existing booking which is at least 7 days in advance, please let us know and we will do our best to help you reschedule to another suitable time slot. Do you allow phones in to the room? We offer lockers for all valuables at the start of each game. If for any reason you are required to have your phone on you this is allowable, however there is a zero tolerance policy with regards to having your out during the game unless it is for an emergency. If our games masters catch individuals using their phones for assistance or to take pictures/videos you will be asked to leave immediately. What facilities do you offer on site? We do not sell food or drinks however we do offer complimentary water and squash. There is a Tesco Metro over the road from Deliverance Escape Rooms where food and drink can be purchased. We have toilet facilities on site, however we would like to remind players that if you wish to use these facilities prior to your experience please allow enough time as we can not afford for toilet breaks to delay the start of a game. You will have the option to leave the room during an experience if needed however the clock will not be stopped. Please be aware that we will only allow bottled water into the rooms in order to limit any potential mess that spilt food or fizzy/sticky drinks could cause. Due to the intensive nature of the Experience we are not able to accept intoxicated visitors. If you are visibly under the influence prior to the game commencing you will be refused entry, or if our games master notices this during your experience we have the right to cut this short. Similarly, if you are disruptive or present a threat to our staff or rooms we will be forced to end your experience early and you will be asked to leave our premises. There is no need to use brute force or smash anything. Generally, if something looks like it should move however when using reasonable force it doesn’t, it may indicate that further actions are still required. A health and safety briefing will be provided to your team prior to the experience commencing. Please take care of our props and decorations as time, effort and money has gone into making this experience the best it can be for our customers and therefore we would like the set and props to remain in the condition that you find them. What is the accessibility like? Our location are upper floor offices and unfortunately we do not have a lift, therefore customers will need to consider the fact that they will need to climb stairs in order to access the rooms. Also, the nature of some of the rooms means that there are accessibility limitations. Please feel free to discuss any possible issues prior to booking and we can offer further assistance in the hope that we can accomodate. If you are pregnant or suffer from heart conditions, please be forewarned that there may be elements of certain rooms which could (not necessarily will) startle players and therefore we advise that you play at your own risk. Again, please feel free to discuss any concerns prior to booking as alternative methods of play may be possible to suit your needs. Unfortunately we are not wheelchair friendly. 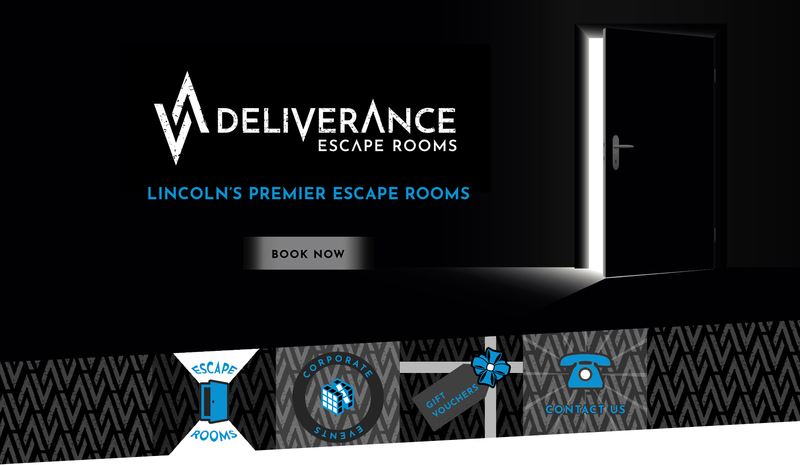 Our address is Deliverance Escape Rooms Upper Office 2-4 Clasketgate, Lincoln, LN1 2JS. Click here for a link to Google maps. Once you arrive, please go up the staircase which you find in front of you, and this will lead you to our reception and lobby area where you will be greeted by a member of or team. We recommend wearing comfortable clothes and shoes that you will be able to move around in. We will try and adapt the temperature of the rooms depending upon the weather. Can we bring someone extra? If you arrive with extra players than allocated at the time of booking, the standard ticket price will apply – if you know this is going to be the case please try and let us know in advance so that we can update our system and to sort formalities before your arrival in order to save time. Please be aware that we can not allow more than 6 players into the room per game, therefore if you arrive with more than this allocated number of players we will have to consider our availability to see if we can fit any extra players into other rooms.